I just adore this wonder herb called aloevera and am fascinated by its multifarious uses. Fresh aloevera gel is one of my favorite beauty aids. I use it for just about anything – as a hydrating mask, as a conditioner, as an antidote for dandruff and last but not the least to soothe minor burns. I have a special preference for natural skin care products which contain aloe. So when I received a bottle of Skin MD Natural Shielding Lotion, I was more than willing to try and test this product on my skin. Besides aloe-gel, it contains chamomile extracts, arnica, antioxidants like vitamin-E, and a humectant which is 6 times more effective than glycerin – and all these ingredients play a major role in skin care. It’s also hypoallergenic, paraben free and not tested on animals. Surely these reasons are compelling enough for anyone to consider using it without any qualms. Now, I have to admit that I have an oily skin that tends to become quite dry and flaky in winter. And this time around, the weather is extremely chilly – just the type that squeezes out the moisture from the skin like anything leaving it completely high and dry. No wonder even my oily skin had begun to resemble a parched paper on which I could literally scratch my name. So to tackle these wintry woes, I tried Skin MD instead of my regular body lotion. I just squeezed a little of it on my palm and noticed that it was a bit unusual compared to other lotions – colorless, thin, watery and more or less odorless. I smoothed it on my arms and legs and it soaked right in. There was no oily, sticky feeling afterwards and I could attend to my other chores right away. Other thick, creamy lotions that I have often used tend to leave an oily residue after application and it is only after some time that it gets absorbed completely and my hands can be put to some use. So this lotion is particularly helpful if you are in a rush or don’t have the time and patience to wait for it to dry. And the other thing that I liked about this product was that it did not have any discernible fragrance. I simply can’t stand strong scents wafting to my nose either from lotions or perfumes. This one’s however pleasantly different. But did it give me the desired results? Most certainly it did – in fact, much more than what I had expected from it. My skin felt rejuvenated almost immediately after the first application. I began to apply it twice daily on my hands, elbows, knees and legs and I’ve been using it for the past 10 days and I’ve noticed a remarkable change in the texture of my skin. And I am being completely honest with you when I am saying that my hands and legs never felt so soft, smooth and silky. This lotion is indeed a godsend for dry skin, especially in winter. Another plus point is you need not reapply it several times. At least for me just 2 applications per day were more than enough. Initially, I was a bit hesitant to use it on my face as my skin is acne-prone, but after learning that it was non-comedogenic (does not block the pores) I gingerly applied it on my face and neck after a bath. And the usual after-bath tautness and dryness that my facial skin experienced during winter was replaced by a fresh, crepe-free look. And I haven’t had any acne flare-ups after using this. So I can say that it’s absolutely safe to be used on an acne-prone skin. I’ve even started using it to moisturize my under eye area and so far the results have been good. I used it as an after-shave lotion also. As I had mentioned in one of my earlier posts, I am not a big fan of waxing and prefer shaving to get rid of unwanted hair on my legs. Normally, I slather on a cucumber-yoghurt paste to soothe freshly shaved skin from irritation and to prevent ingrown hair. But application of this paste can be so messy and time-consuming. So this time around, I applied Skin MD lotion soon after shaving. I didn’t experience itching, stinging or any such irritating sensation. This one immediately got absorbed into the skin and it felt so good. All I can say is that my legs look great. They are super soft and satiny smooth by any standards. This product has definitely worked for me; I absolutely love it. And knowing that it’s natural is such a comforting feeling. I’m going to use this lotion all this winter to heal my dried-up skin. I highly recommend it to all those troubled by dry skin. 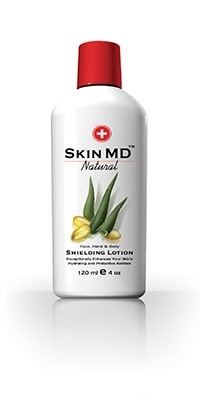 If you want to buy Skin MD Natural Shielding Lotion then you can order it from here. There are some phenomenal skin care products out there made from aloe. It really does work. I use aloe-based products almost exclusively on my skin. This is by far the BEST skin care product I have ever used. It is light, not greasy, no scent, soaks in fast and leaves your skin soft and smooth. I think it helps your skin repair itself. I too am a big fan of Aloe Vera. I’m definitely going to try this as I have the same problem with lotions after shaving my legs. Thanks for reviewing this! I think that’s the product I want to try next. Since so many factors affect why a person develops eczema, a treatment plan that helps heal the lesions in just a few days is a real breakthrough.I advice you to try it! My skin is very sensitive and acne prone and I've tried many moisturizers in my search for one that won't make me break out and that will go with my topical acne gel. For awhile I even just gave up on moisturizing - but I tan frequently so that isn't a solution. My best choice is Alba Botanica - Green Tea & Aloe Oil-Free Moisturizer. My skin is actually in better condition with an even tone after I use it, and it feels so soft afterward. I paid $16 for a 3 oz. jar at Walgreens drugstore. Pricey but it is worth it! I use this and it works wonders. I have super oily skin and when I use this before i apply my foundation I can go 8 hours or more without having to blot. before i would have to blot like three or four times a day.